Britain's private, fee-paying schools are institutions where children from affluent families have their privileges further entrenched through a high-quality, richly resourced education. There is an irrefutable link between private schools and life's gilded path: private school to top university to top career. 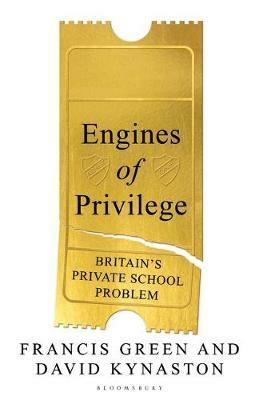 Engines of Privilege contends that, in a society that mouths the virtues of equality of opportunity, of fairness and of social cohesion, the educational apartheid separating private schools from our state schools deploys our national educational resources unfairly and inefficiently; blocks social mobility; reproduces privilege down the generations; and underpins a damaging democratic deficit in our society. Intrinsic to any vision of the future of Britain has to be the nature of our educational system. Yet the quality of conversation on the issue of private education remains surprisingly sterile, patchy and highly subjective. Francis Green and David Kynaston carefully examine options for change, while drawing on the valuable lessons of history. Accessible, evidence-based and inclusive, Engines of Privilege aims to kick-start a long overdue national debate. Clear, vigorous prose is combined with forensic analysis to powerful effect, illuminating the painful contrast between the importance of private schools in British society and the near-absence of serious, policy-shaping debate. Francis Green is Professor of Work and Education Economics at the UCL Institute of Education. He is the author of ten books and 150 papers, and is a recognised authority on the economic and social effects of private schooling in the past and present. He works frequently as an advisor to the the OECD, the European Union and the World Bank, as well as to the UK government. David Kynaston has been a professional historian since 1973 and has written twenty books, including on the City of London and cricket, as well as a series aiming to cover the history of post-war Britain (1945-79), 'Tales of a New Jerusalem'. He is currently an honorary professor at Kingston University.